Tie-Earth Hour celebration (20th March 2009) - GGI-Group size: 4000+ Professionals, Increasing on day to day basis, Come & join us 2 serve Mother Nature. 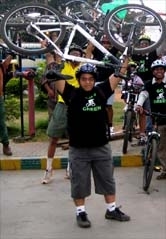 Go Green Go Cycling team was invited for participating in the WWF Earth Hour Campaign organized by ING Vysya Bank. 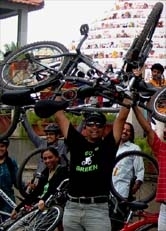 We met lots of enthusiastic people who did admired our contributions of Going Green by using bicycles. Many of them were interested to contribute their part to the Mother nature.. All in all it was a good exposures that we had, Special Thanks to Mr. Kuruvilla Kurian of Frogg.in & also to Mr. Ashok Das CEO SunMoksha Power pvt. 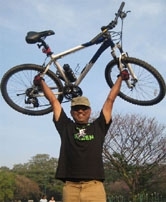 Ltd & Chair person of Tie Bangalore who has invited our team to their L&T South city appartments to conduct a workshop for promoting bicycles. In 2009, Earth Hour is being taken to the next level, with the goal of 1 billion people switching off their lights as part of a global vote. Unlike any election in history, it is not about what country you’re from, but instead, what planet you’re from. VOTE EARTH is a global call to action for every individual, every business, and every community. A call to stand up and take control over the future of our planet. Over 74 countries and territories have pledged their support to VOTE EARTH during Earth Hour 2009, and this number is growing every day.